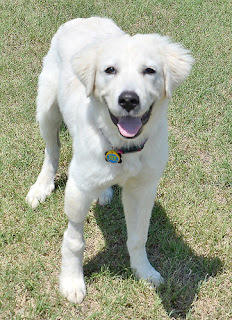 Stella is a three-month-old Great Pyrenees pup. She will be a big girl, already weighing about 30 pounds. She's very playful, and she has a great temperament that should mix well with just about any new home. She's already spayed and potty-trained. How can you resist that adorable smile?! To find out more about this precious baby dog or to see more photos, please click here. OMG! She looks like my Maple Twist, Syb! I wish I could have a third dog! I'd take her sweet face in a heart beat! She wants to be Maple's sister. And she loves Watauga.